Ms. Anne-Stella Fomumbod is founder and chief executive officer of Interfaith Vision Foundation, a non governmental organization based in Cameroon’s Northwest region that works with community-based organizations to promote human rights and democracy at the grassroots level. An advocate for women’s rights, she has successfully lobbied for the passage of laws protecting the rights of women, particularly widows, in local communities, such as the Metta Charter on Widowhood (January 2010). For her efforts to promote gender equality in local governance and development processes, she received the Women’s World Summit Foundation’s 2010 Prize for Women’s Creativity in Rural Life, as well as a National Award for the Advancement of Women in 2004. On October 18, 2012 Anne Stella Fomumbod, a WDN, member was among several distinguished women honored with the 2012 International Alliance for Women (TIAW) World of Difference 100 Award. Fomumbod has worked through WDN and the organization she has founded, Interfaith Vision Foundation Cameroon,to ensure women are involved in the decision-making process of their communities. 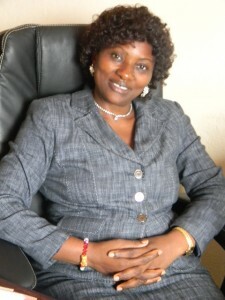 Anne Stella Fomumbod is the Founder and Director of the Women’s Democracy Network,Cameroon Chapter. Rehmah Kasule, a WDN member from Uganda, a 2011 recipient of the TIAW World of Difference 100 Award, was inspired by Fomumbod’s leadership and nominated her for the 2012 TIAW award. increase the number of women participating in the 2013 elections in Cameroon. Anne Stella was nominated by the BBC Africa audience to take part in the 2013 session of the BBC’s 100 Women Conference in London. She was nominated due to her advocacy for women’s rights and participation in decision making bodies in Cameroon.Ms. Fomumbod had been a professional teacher for twenty-two years and retired from her work as Regional Pedagogic Inspector of secondary education in order to take up development work.